In the world of social media tools it can be difficult to understand the similarities and differences between them all (click here for our comprehensive guide to social media tools). The social media aggregator tool is a bit different from the others. Rather than assisting with content creation, scheduling or posting, a social media aggregator helps you make the most of the content you already have. What is a Social Aggregator Tool? Social media aggregators are tools that gather, or “aggregate”, existing social media posts from several platforms and combine them into a single feed. This social media feed can then be displayed on a website. While other types of media aggregators pull from many different sources and brands, a personal social media aggregator like Juicer pulls content from social media accounts you own. What is a Network Aggregator? You may also see a lot of buzz around the phrase “network aggregator”. A network aggregator is simply a broader term for social media aggregator. A platform ’s social network aggregation ability varies but they all basically serve the same purpose. How Does a Social Media Aggregator Benefit My Brand? A well-managed brand is one that has mastered consistency. That means no matter how a customer is interacting with your brand, they can expect a similar experience on each outlet. For example, if a customer first interacts with a brand on Instagram, they’ll become accustomed to the color themes, brand voice, and overall feel. When they visit the same brand’s website, the expectations they developed from the Instagram account should also be reflected on the website. Using a social media aggregator makes it easy to ensure that customers are seeing familiar imagery from your social media on your website. This instantly triggers brand recognition and makes them more likely to spend more time on your website and possibly convert. Additionally, it’s important to make sure that your website stays up to date. Whether you’re a one-man show or have a team to assist you, consistently updating your website with the latest images from your social media accounts can often be a task that falls to the wayside. However, a social media aggregator eliminates this task completely from your to-do list! Once installed, the social media aggregator will automatically refresh the content pulled from your designated social media platforms. This ensures your website’s content is always fresh and is one less job to complete during your work day. Can You Use a Social Media Aggregator Somewhere Besides a Website? 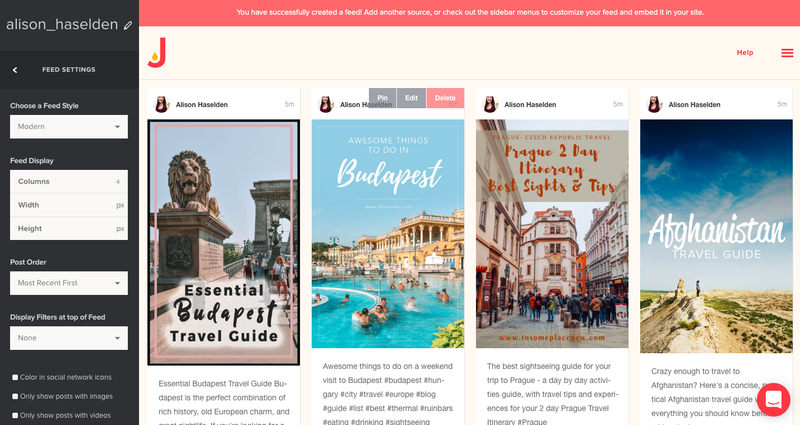 Another bonus feature of the Juicer social media aggregator is the ability to design custom feeds for display at events! Juicer customers have used social media walls at events such as weddings, holiday parties, or product launch events. A social media wall is a great way to engage guests in your special event. By customizing your social media aggregator around a specific hashtag, the aggregator will pull in your guests hashtagged images and project them live onto a wall or screen at the event. It’s an easy way to make your brand interactive and more approachable to potential customers. Just make sure you let your guests know what the event’s signature hashtag is! 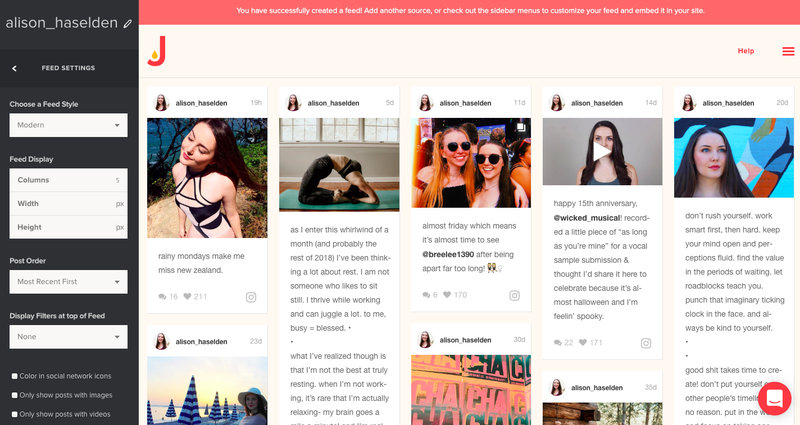 How Does the Juicer Social Media Aggregator Work? After linking your social media accounts to the feed, you have many options for customization. When designing your custom feed, we’ve ensured you have all the tools you need to achieve your brand’s goals. As you work, you’ll be operating in the black-and-white sidebar to the left of your screen. The main sidebar offers various customization options. It’s recommended you work your way from the top of the list to the bottom for greatest efficiency and ease of access. “Social Media Sources” allows you the opportunity to connect your desired social media platforms. 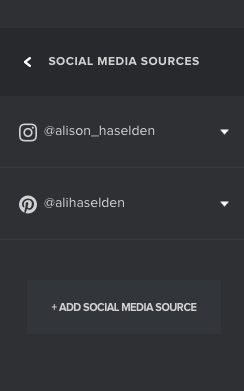 The “Feed Settings” and “Custom Design” tabs are where you’ll customize each aspect of your social media aggregator feed to best serve your brand. The “Embed In Your Site” tab generates your feed’s custom link which you can embed on your website. The “Moderate and Filter”, “Analytics”, “Share Your Feed”, and “Last Sync” tabs offer additional ongoing maintenance and reporting options. In the “Feed Settings” tab you have options to adjust elements such as Feed Style, number of columns, width of columns, height of columns, order of posts, and more. This edit option is optimal for those who have linked several social media accounts with varying post sizes. 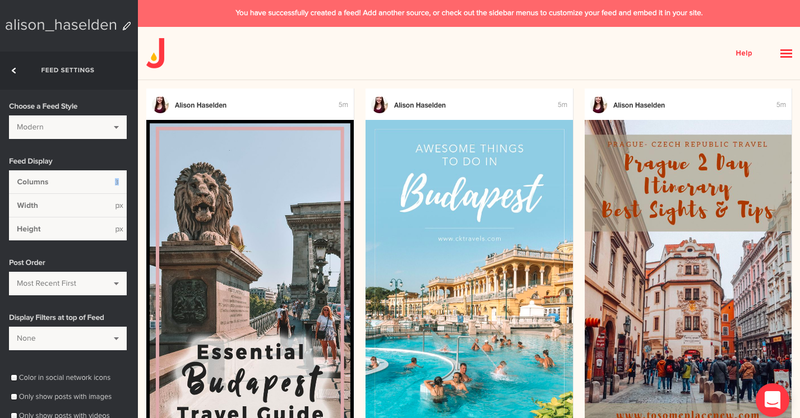 In the “Custom Design” tab, you’re able to tailor the colors and visuals of your feed to match your brand guidelines from the text, link, post background color, and more. For those with intricately designed websites, fear not! You can make sure the feed blends seamlessly into your website design. This tab is very important. 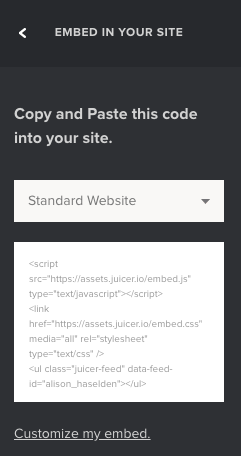 This is where your custom feed’s code is generated for insertion onto your website! Sound confusing? Don’t worry! The Juicer team will send you a step-by-step email to assist with set-up and answer any additional questions you may have. 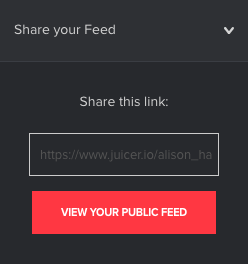 The “Share Your Feed” tab offers a custom link to your social media aggregator feed that you can send directly to customers or post in the header of your social media platforms for easy access. This link is also the one you’ll use when setting up a social media wall. Ready to get started with your very own social media aggregator? Start your free account today or check out the other Juicer plan options.